Do you have $16,000 to over $120,000 in profit to waste this year? If you’re still using sight glass, time control, or volume acquisition for Phase Separation or Interface Detection at your dairy, you’re losing money. Product waste is a reality in any dairy, but with the continually shrinking profit margins you face year-after-year, the need to reduce product waste is also a reality. Unnecessary BOD fines for excess solids in waste water. Excess product loss through inefficient CIP Monitoring. Excess product loss when switching media. Increases in your water bill by using far more water than needed. And, added cost due to undetected failure of cooling circuits. To put this into perspective, an ice cream maker replaced a time-based system with turbidity sensors. Once the ITM‐3 was fully integrated and running, the plant witnessed a thirty second difference between the old timer based method and the new turbidity based method when they reviewed changeovers recorded on their PLC system. The old timer method switched the control valve 30 seconds earlier than the new turbidity based method both for water pushing the product at the end of a run and when the next product was introduced into the system and pushed the water. This meant that they were losing good product down the drain with every changeover and were also pushing residual flush water into the pasteurized storage tanks when they ran the next mix through the pasteurizer. Once we introduce the water, we have a timer that at some point creates a diversion. If the timer is too short, we send good product down the drain before the water makes it to the valve. The system shuts down after some period and we leave that pipeline charged with water. On the other hand, if the timer is too long, we’ll end up with water in the product tank or water on the next load going into the product tank. Product moves through the system at approximately 30 GPM, so the net water savings per water flush/changeover is about 15 gallons of water. The bottom line for the plant is a water savings of 75‐150 gallons daily at that one application point, which adds up to a conservation of between 19,500 and 39,000 gallons of fresh water annually at that single application point. In addition to water savings, they are recovering 15 gallons of good product that was going down the drain with each changeover at a cost of $4.25 per gallon plus sewer charges of $7.48 /1000 gallons. Their net actual annual cost savings after payback of the system was $16,281.80. “We had no idea that our old timer based method was wasting an average of $63.93 per day in profit or $16,621.80 annually after payback.” -- Southeastern US Ice Cream Manufacturer There is always a mixture of milk product and water during phase transition. To save money, you must minimize the time in which usable product flows through the pipe at both ends of the transition. The sight method is the worst case scenario. Timer-based methods fail to take into account the daily changes in water pressure, equipment changes, and product changes. Time-based methods are prone to error, and erring on the “safe side” results in more product loss, excess water usage, and excess solids in waste water. The mixing ratio and concentration must be precisely measured to affect the change-over at the optimal point every time the process is run. 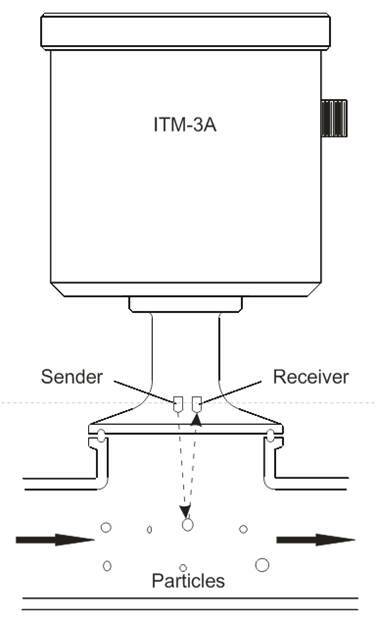 An Anderson Instrument ITM-3 turbidity sensor can automatically trigger the optimum transition point with great reliability and precision in contrast to the time-controlled phase separation where the required safety time interval forces costly product loss every time. If you process relatively durable products like yogurt, cheese and ice cream, turbidity sensors help avoid unwanted water that may add coliform bacteria into your product. This reduces product durability, presents a potentially serious safety risk, and creates recall exposure and damage to your company image. In this application nothing can beat the Anderson Instrument ITM-3 turbid ty sensor for a guarantee of consistent and reliable product quality. The turbidity sensor allows instant and accurate monitoring of product changeovers or CIP programs. During the phase separation of the media or during the start-up and emptying of the process, the media must be differentiated. The turbidity sensor can detect the instant a liquid media reaches a pre-defined specification, automatically switching media to its appropriate container. The benefit to a CIP system comes from having a god control pre-rinse. The turbidity sensor determines when the pre-rinse has flushed the soil from the system. If the water runs to long, you use far too much water and don’t know where your soil or high BOD comes in. 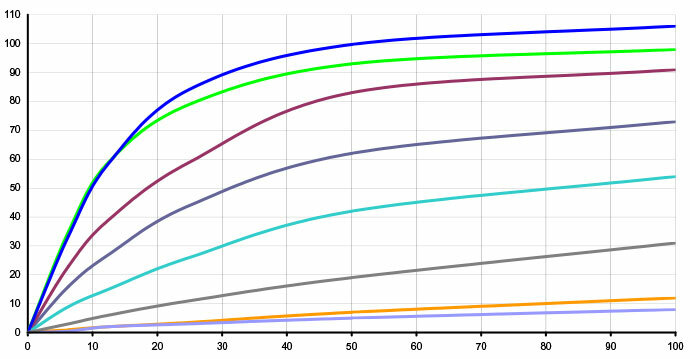 If the first rinse is done correctly, the rest of the wash cycle is predictable with corresponding chemical savings. The infrared light is directed to the center of the pipe. This eliminates any potential variances caused by temperature, changes in viscosity, or build-up on the pipe. The measurements are always accurate and repeatable. The ITM-3 is located at the discharge of an HTST processing system to continuously monitor the relative turbidity of liquid in the pipeline. 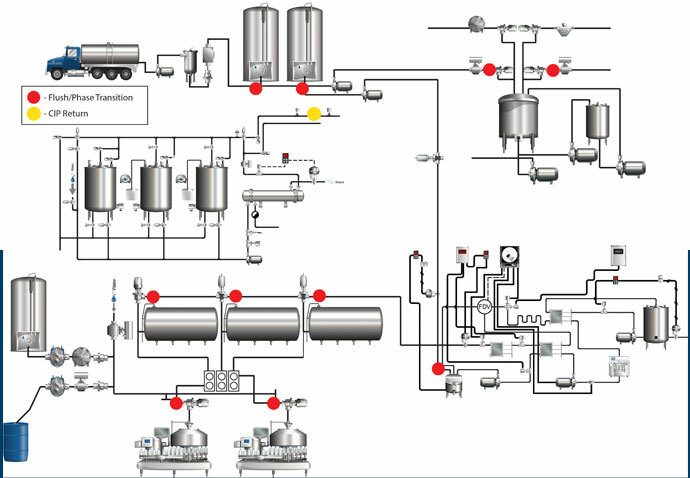 When a product process run is completed a water flush is initiated on the input side of the system to push the product from the system into the pasteurized storage tanks. The ITM-3 continuously monitors the solids content of the outgoing liquid and gives an analog output signal of the relative turbidity. As the turbidity begins to decline caused by dilution with water a decision is automatically made by the control system to redirect flow from the storage tanks to drain or the waste water recovery system.